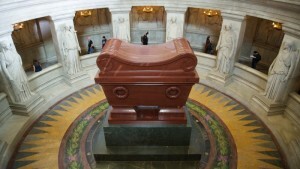 Napoleon’s tomb is located inside the Hotel National des Invalides, precisely under the Dome des Invalides. We will help you discover this fantastic place by going back in time. This royal chapel was built between 1677 and 1706. The interior designs glorify Louis XIV, his armies and his power. During the reign of Napoleon Bonaprte, the church was used for military activity. Napoleon died on May 5th, 1821, on the island of St. Helena. His body stayed there until 1840, when it was transferred to Les Invalides while his tomb was being built. The infamous tomb is made up of red quartzite and is surrounded by a laurel crown. Eight “victories” are sculpted on it to symbolize Napoleon’s campaigns. There is a statue of the Emperor in the back of the tomb to symbolize him and his empire. 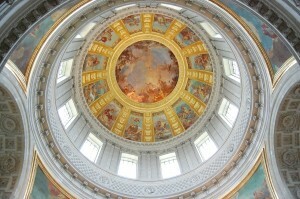 During Napoleon’s reign, he accomplished many things, the most significant are depicted in the circular gallery surrounding his tomb in the form of bas-reliefs: administrative centralization, State Council, Civil Code, Concordat, Imperial University, court of accounts, code of commerce, Major Works and the Legion of Honor. The visit to Napoleon’s tomb is for everyone. The visit won’t take up too much time, either. It should take about 45 minutes. Tickets bought online are queue jump tickets, so you don’t have to wait at the till. Tickets must be printed at home – you cannot enter the museum without these printed tickets. An additional administration fee of €0.95 applies to tickets bought online. This is a special 3 hour tour of the Louvre, Les Invalides, Place Vendôme, École Militaire and the Legion of Honor, all of which are monuments related to Napoleon.